Does the appearance of your putter matter to you? If the answer is yes, then you are likely to love the Odyssey Metal-X Milled putters. 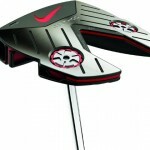 These are visually stunning putters that stand out from the rest of the Odyssey line. 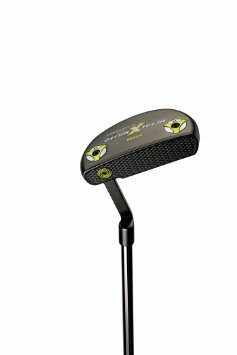 This review covers the 330M model of the Metal X line, which is a great looking putter that offers the player a compact mallet-style head and plenty of feel for the ball. This putter would be a solid choice for the player who is interested in a mallet putter but doesn’t want to totally sacrifice the feel they would have with a blade. Many large-headed mallet putters offer a great roll, but that roll comes at the expense of feel for the ball. The touch that is required to putt well can be lost with a big mallet head, so this model is a nice compromise. The head is large enough to swing freely through the ball, but not so large that you will have trouble with things like speed control. In other words, this would be a great pick for a player who is hoping to make the transition from a blade to a mallet. As with many of the other putters in the Odyssey line, this one includes adjustable weights so you can dial in the feel and performance of the club just right for your needs. 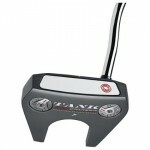 However, as it is a milled product, you are going to have to pay a pretty steep price for the putter, which retails around $250. The putter is offered in lengths of 33’’, 34’’, or 35’’, so players of all sizes should be able to find one that is comfortable at address. There is something about the feel of the ball coming off of the face of a milled putter that really cannot be duplicated. Often, however, that feel is something that only comes in blade-style putters, so it is great to see it available in a small mallet head. If you are looking for an opportunity to get into the world of mallet putting without sacrificing that all-important feel for the ball at impact, the Metal X Milled 330M should be high on your shopping list.